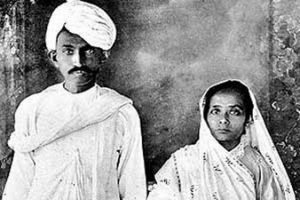 Mahatma Gandhi at the age of thirteen and his wife Kasturba Gandhi at fourteen years old. This excerpt is taken from Mahatma Gandhi’s autobiography; as an adult he recognizes the immorality behind the fact that he was married off at the age of thirteen without being fully conscious or being asked his opinion. This freedom fighter’s story is not unique. According to the International Center for Research on Women (ICRW), which is partnered with the United Nations International Children’s Education Fund (UNICEF), child marriage affects every third girl in India. 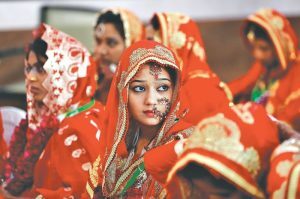 In order to mitigate child marriage the Indian government banned the practice through the Child Marriage Act of 2006. Even though child marriage is now illegal, the practice still continues. Without clear social changes the practice of child marriage will endure and will continue to have negative outcomes for individuals and societies such as: unequal treatment of women in society, a lack of female education, and unequal health consequences. These issues can be addressed through the empowerment of girls, the mobilization of families and communities, as well as establishing and enforcing government laws pertaining to child marriage. According to UNICEF, child marriage is defined as the formal or informal union between boys and girls before they reach eighteen years of age. 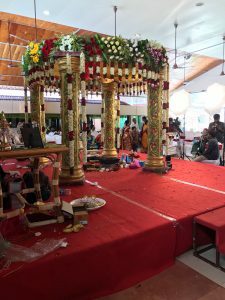 This practice is usually carried out due to lack of education, poverty, cultural practices and customs, as well as the inequality women face in Indian society. Child marriage usually leads to a low level of personal development and wellbeing for the girls because after marriage they typically suffer from a lack of education and healthcare and violence against their person. Due to these negative results, child marriage is a violation to human rights according to the United Nations. Young girl dressed for her wedding. Gender is central to how society assigns roles, responsibilities, resources, and rights between men and women. Women hold little to no power in Indian society. According to Dr. J. Florence Shalini, a professor of social work, women are only respected when they give birth to a male child as it ensures the family lineage and bestows power to the family in society. Another reason for child marriage’s prominence is that child marriage allows a family to marry off a girl when the family is celebrating another festivity or the marriage of older siblings, thereby decreasing the cost of the child’s wedding. Indian society places more importance on educating their male children because they see it as an investment. Educating a girl is considered parallel to throwing money away because a girl will later move in with the husband and therefore her education will provide no direct economic benefit to the girl’s nuclear family. According to ICRW, an increased level of education for women results in an immediate positive impact, to the women and society, as educated women join the workforce and marry later. According to Dr. Crystal David John, India has the greatest number of professional working women. While this may sound like a laudable statistic, it is primarily due to the fact that India is the second most populated country in the world. However, the girls forced into child marriages are not able to continue their education, which also has a negative impact on their children. When child brides are married they often are expected to drop out of school because they have a new role to play: take care of the home, the children, as well as the extended family. Dr. Shalini explained this negative impact; uneducated women cannot pass their education on to their children and thus gender inequality is then passed on. Therefore, child marriages create a vicious circle of gender inequality that is usually not questioned because girls’ mothers and grandmothers have had similar experiences. If the society could change the way that they educate not only young girls but also young boys on key skills such as confidence building and informed decision-making, it could reduce the amount of child marriages. The increase in education has been shown to decrease child violence, and it increases women’s ability to make a meaningful contribution to society and the economy. Education is also highly correlated to health care that the young girls receive. According to Girls Not Brides (GNB), a NGO dedicated to reducing child marriage, the leading cause of death in girls between the ages of 15-19 is due to complications in pregnancy. GNB claims that a child is 50% more likely to die when its mother is under the age of 20 either from a stillbirth or within the first few weeks than a child born to an older mother. Young wives are usually married off to older men and are unable to assert their wishes, especially when it comes to pregnancy or family planning methods. Therefore, these girls are more likely to have children at a young age; they assume the role of mother at too young of an age and keep having children since they have no education about or access to contraceptives. This further increases India’s explosive population growth. having a good time. After a few moments a young woman sat with us and explained that she and her husband live in Florida. Of course, we asked her about her wedding ceremony. She told us that she had an arranged marriage and that she was happy in her marriage. She also mentioned that the newlyweds were part of a love marriage. I thought this was interesting as it was clear that she thought it was a big deal that it was a love marriage, something that in Western societies is seen as the norm. I would imagine you would have to be somewhat of a rebel in order to avoid an arranged marriage and marry someone you love, especially if you are part of a conservative family. Similarly, the family determines if their child will be part of a child marriage. Sometimes the children that are being married off are being forced against their will or they agree to the marriage only because their parents believe it to be best for them. The responsibility is with both the government and society to stop the practice of child marriage. Since the passage of the Child Marriage law, the government has done little to enforce it or to stimulate societal changes. Child marriage could be mitigated by reassessing the issue from all sectors and levels of society and government. These entities need to work together to establish a concrete common goal and policies and actions to achieve it in order for this change to be successful. Children should not be subjected to this inhuman practice. A child can’t even begin to understand the commitment and life changes that are about to occur to them. Even though child marriage is declining, the rate of decline is slow. A change in social behavior as well as education of the population is possible; it is currently being attempted on small scale and it has been shown to reduce child marriage. Providing better education to both girls and boys about the important contribution that women can make in society would provide a strong catalyst to changing how women are viewed in society. Successfully reducing child marriage would not only allow children to choose their own paths in life but it would also ensure a brighter future for India as a whole. David John, Crystal. “Economic Policy in India Since Independence” Presentation at Women’s Christian College Chennai, Tamil Nadu. 9 October, 2017. Sheryl, Joy. “Demographic and Family Planning” Presentation at Women’s Christian College, Chennai, Tamil Nadu. 12 October, 2017. Shalini, Florence. “Gender Issues and Development in India” Presentation at Bishop Heber College, Trichy, Tamil Nadu. 28 October, 2017.